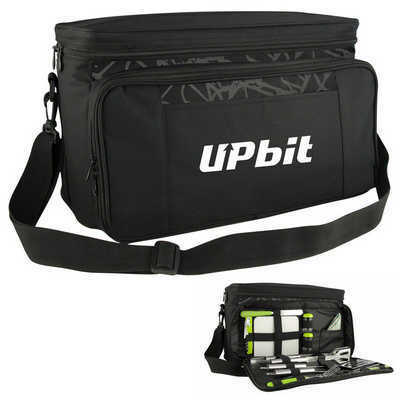 Large|zippered insulated cooler with BBQ tools and adjustable shoulder strap. Supplied in polybag. Polyester fabric bag which includes: 3 BBQ tools, 2 knives, 1 cutting board, salt & pepper shakers, 1 fork, 1 bottle opener, and 1 napkin.. Colours: Black, Dimension: 230mm H x 380mm W. Price includes : 10 Day Service Transfer Print (10 DAY PRODUCTION ONLY) - One Colour/position . Setup is included.